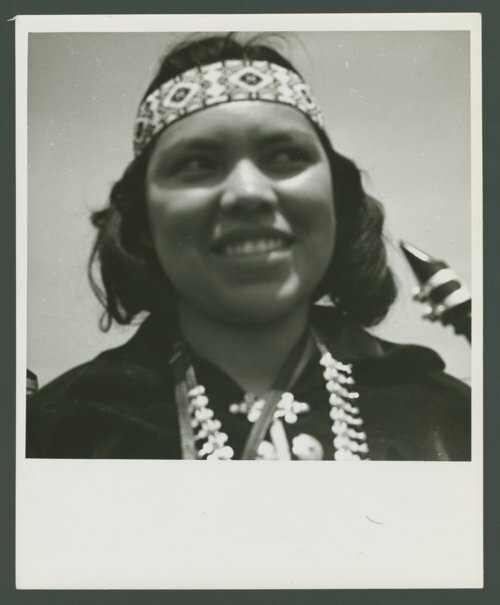 This photograph shows Julia Paisano, the only female member of the Atchison, Topeka and Santa Fe Railway Company's inter-tribal band. The group was organized in 1923 when three Native American musicians performed during a company picnic at the Santa Fe shops in Winslow, Arizona. Later referred to as the "Santa Fe All Indian Band". Members consisted primarily of employees from the Santa Fe Railroad and representatives from as many as twelve Native American tribes. The band performed at a number of functions across the country including President Dwight Eisenhower's inaugural parade. In 1964, the band disbanded due to the lack of members.